5 M 6F. Running Time 125 minutes. George Gordon Lord Byron-poet, satirist, raconteur, phenomenal athlete, animal rights activist, duelist, political revolutionary, bisexual incestuous womanizer, loyal loving friend and generous philanthropist—also became in the very invention of Celebrity. Vain, flamboyant, indiscreet and yet surprisingly self-aware, Byron is perhaps the first man to raise the question: "Can a man live too much of a life at the expense of all else?" 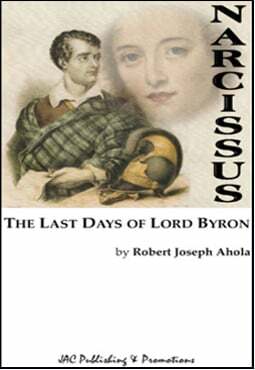 On the eve of his final battle for the Greek War of Independence (and dying of pneumonia) Byron meets with the ghost of his best friend Percey Byshe Shelley for a reckoning…and an answer to the eternal conundrum he has created.